A visceral, devastating 30-minute portrait of the Holocaust depicted through the eyes of early French New Wave director Alain Resnais (of Hiroshima, Mon Amour fame), the viewpoint is a novel one as far as many of these types of documentaries go. In its stirring narration, it does not offer solid matter-of-fact chronology, but instead a non-linear framework, as if narrated by memory. Memory is a key theme in much of Resnais' work, this included; his interest seems primarily to lie in mankind's collective memory in regard to mass genocide, how easily we try to compartmentalise it into the past – even merely a decade after the close of the Second World War. The title comes from the German 'Nacht und Nebel', a secretive 1941 Nazi decree which allowed for further suspension of due process and – as the implication lays, under cover of 'night and fog' - for a reign of arrests, torture, and police capture of any perceived threat or challenge to the Third Reich. The consolidation of the National Socialist police state led to and was bolstered by the efficient death machines of Hitler's empire: the camps. Yet the title of the film is its' largest reference to facts, figures, or policies; Night and Fog is concerned with humanity, with our grotesque and inevitable capacity for destruction; with our astounding inability to reconcile ourselves to our own natures. The camera glides eerily over the newly-growing grass peeking through forlorn railroad tracks, the startlingly unassuming brick buildings, the fences and gates, suggesting the sinister human uses for inanimate objects, allowing our imaginations to fill in the void. It does not deal in political machinations or even mention the ethnicity of those murdered, and this makes a great deal of sense to me; it is interested in widening the experience to emphasise the raw humanity there, the sheer terror of its graphic images of severed heads and bulldozed bodies, taken from footage of Auschwitz and Dachau. 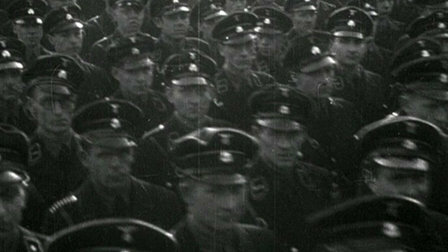 Resnais consciously chooses to highlight the tragic absurdity of it all. The film actively avoids doing what so much Holocaust-related material attempts to do; to bookend the period with moral reasoning, to relegate the horror to the dustbin of history, so to speak. Night and Fog does not centre around the dishonest act of elevating its viewers above the despair by raising their arms to heaven and crying, 'Never Again'.